I really like the mid 1960s tailored styles. To me they always look fresh and modern, feminine but also practical and business like. Although the hats and gloves are of their time any one of these items could be worn today. I really like the neat practicallity of these designs, using good quality fabrics, colour and pattern. All of these designs are by Nina Ricci, from about 1964 to 1967. At this time many Nina Ricci patterns were licenced to Vogue, and I have one that I bought on eBay for around £20 which is alot more than I usually pay. But as I opened it and inspected the 47 pattern pieces I realised I had quite a bargain. The pattern includes a skirt (which is actually a skirt attatched to a camisole), a jacket and a coat. When it was new this pattern cost one guinea (21/-) – which is about £17 in today’s money. As many modern patterns have three or four pieces and you often just get one item with variations, an item like this, based on the designer fashions of the day, seems like an amazing investment. And such a joy to open and find you are the first one to do so. Everything is folded exactly as it left the factory in 1966. I found that the original purchaser has written 1/11/66 in pencil on the envelope, which I am going to assume is when she bought it. It doesn’t have markings, but perforations on the pieces. These are fairly easy to follow. When I have a pattern like this I use a pencil to write on the number of the pattern piece, the name of the piece, the grain lines, how many to cut (if it is not two). Why are there so many pieces? For the dress and camisole there are only five pieces – 16, 17, 18, (skirt and pocket) 19, 20, (camisole). The camisole is cut twice, with one used as the lining. The envelop gives all the details in French and English, and the instructions are full enough. The suggested fabrics – which are the ones used for the photograph – include wool for the suit, and linen for the overblouse. The material to use for the underlining and the camisole is not specified. Does anyone know what might have been envisaged? I will use silk. 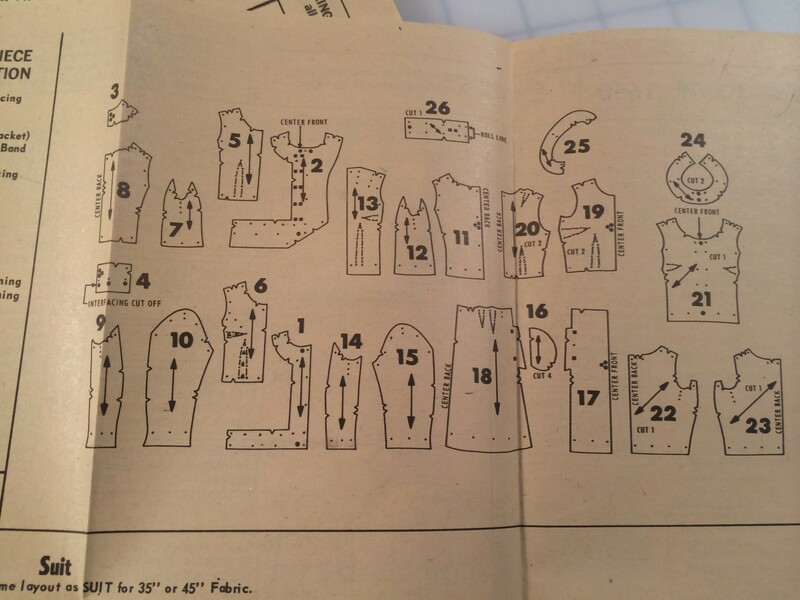 I know some people find these old patterns challenging, they dislike perforations, they dislike single size patterns as they are slightly more difficult to alter, they have lots of pattern pieces and they look “advanced” or “tres difficile. I would urge you to give them a try. They produce beautiful, historic garments that are a joy to wear. 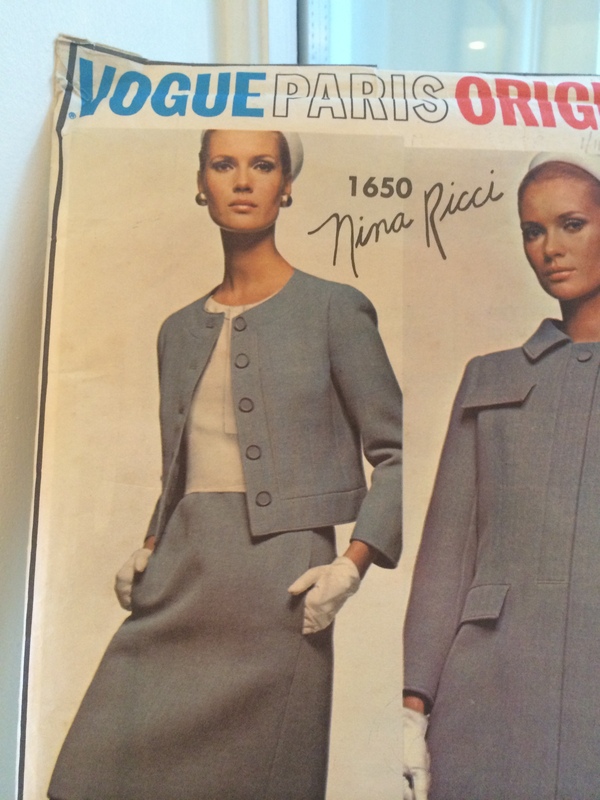 Fancy being able to wear a 1960s Nina Ricci suit, that fits you perfectly, for a few quid? Watch this space as I am going to do it! Fantastic! I can’t wait to see them! Are you making this as part of the swap, or a separate project? Yes Lyn I am thinking of substituting this suit for the Kimono jacket and trousers that I had planned to use with the charcoal wool. A bit reckless at this stage but I have the urge to see this pattern made up. I would use for underlining – silk organza… for camisole and lining – silk. I stitched the Vogue Paris Original label into Nina Ricci 1623 last night. I really love these 1960’s patterns for their fit (seem to be made for me), the quality of workmanship they demand and the sheer enjoyment of assembling a beautifully drafted pattern. When working with one of the non printed patterns I tend to trace them off – something I never normally do – and transfer all the markings as I find the tissue paper can disintegrate if subjected to too much handling/close inspection from a sociable cat! The forgotten pins, the notes added by their former owner (where did she wear this, was it a success?) and sometimes (as in this pattern) a magazine clipping of the original all add to the pleasure I get from making my own clothes. With your project I would echo Red Point Tailor. These patterns deserve the best. Oh I love that dress too. What colour/fabric did you use? I would love to see a photograph. In response to you and RPT I have only used silk organza once as it is so very expensive. I am going to use habotai silk lining for the interlining of the overblouse because I am using wool rather than linen and its already a bit on the heavy side. That is such a lovely jacket. I hope yours is in yellow mohair too! I’ll be watching, eyes wide open! Can’t wait to see how it turns out. Such a lovely pattern. Oooh, how exciting Kate, I look forward to your ‘designer’ suit. I have some very aged patterns I’m afraid to open. I ventured forth once and was completely put off buy the perforations – yikes! Maybe I should investigate. It really is a beautiful pattern, an artwork in itself. I know you will make a stunning outfit using it.